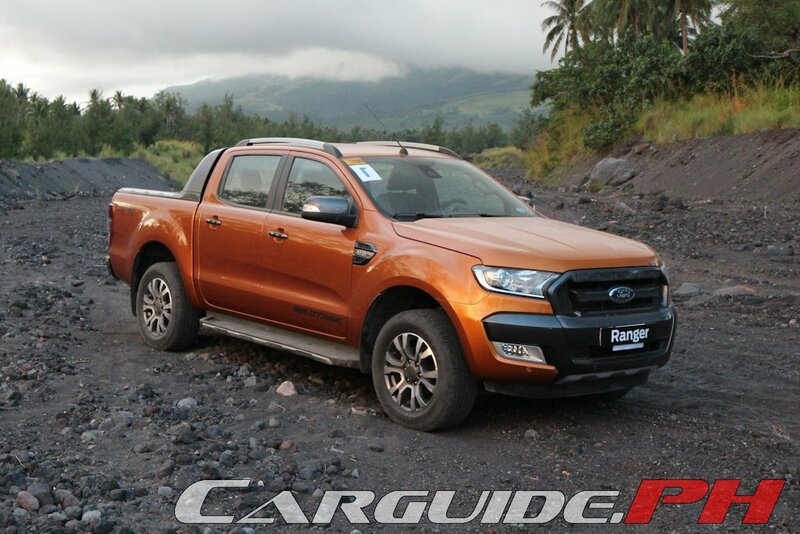 UPDATE 2: Read our First Drive of the Ford Ranger 2.2 Wildtrak here (8/19). UPDATE 1: We now have a copy of the spec sheet below (8/18). 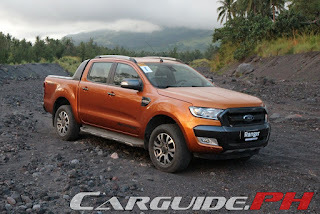 Ford Philippines officially debut the new 2016 Ranger with an epic 175-kilometer ride-and-drive activity through various terrain settings in Bicol. We’ll reserve our more in-depth feature in the coming days, but here’s all you need to know: it’s totally awesome. We drove it through volcanic ash, broken pavement, and muddy trails where it performed beautifully. All in all, it continues its legacy as the segment’s toughest and smartest pickup truck by offering a wide array of new technology, some of which you don’t even get in a comparably priced SUV. The updated looks are already a dead giveaway to the extensive work done on the Ranger. However, it’s more than just skin deep. Front and center is Ford’s newest-generation infotainment system, SYNC 2. Shared with the likes of the Everest, it allows for even more natural voice commands for vehicle functions allowing you to keep your eyes on the road and hands on the wheel at all times. Furthermore, there’s also a new 230-volt power socket that can juice up a laptop on the go. All Wildtrak variants (the ones we drove during this particular outing) come with front and rear parking sensors and ESP or Electronic Stability Program. The range-topping Wildtrak 3.2 adds Lane Keeping Assist and Lane Keeping Aid, Adaptive Cruise Control, and Forward Alert. Under the hood, the Ranger continues with two proven powertrains: the 3.2-liter 5-cylinder and 2.2-liter 4-cylinder Duratorq engines. Both of these engines, but more particularly the 2.2-liter, sees substantial changes seeing a slight power bump bringing the output to 160 horsepower and 385 Nm of torque. The 3.2-liter 5-cylinder continues with 200 horsepower and 470 Nm of torque. The biggest change is the move of the Ranger to an EPAS or Electric Power Assist System. Necessitating the adoption of EPAS for all the new smart tech features of the Ranger, it also makes it more economical than before. Additionally, it also makes the interior much quieter because of the elimination of the power steering pump. Outside, the changes to the 2016 Ranger is dominated by the new front face with the projector headlamps (halogens on all models, no LED or HIDS, sadly) and a bolder grille. The Wildtrak ups the drama with dark trim elements on the grille, side mirrors, door handles, bed rails, and tail lamps. New 18-inch alloy wheels complete the look. The popular Chili Orange color has also been retired in favor of a brighter shade dubbed Pride Orange. Inside, it has a heavily revamped cabin now with a predominately horizontal theme. New gauges, steering wheel, and center console form the foundations along with new seats and even a leather-stitched upper dash panel for the Wildtrak. Reservations at dealerships start next week with customer deliveries starting on September 1. Given the new pricing albeit the enhancements, both the Ranger and Hilux are giving the Navara a huge boost to its sales. That is if the Navara will not increase its price. With all the variants and all the features still intact on the lower WIldtrak variants I disagree with you. ute putting a real competition, but falls short in the terms spoken before when compared. It's because Ford dealers are crooks! Spec sheet says variants from the XLT and up have cruise control with adaptive speed limiter. 2.2 Wildtrak variants now get back up cameras too. I'd rather go to Nissan NP300 due to its pricing and looks. Lalo pa yatang darami ang mga bagong navarra ngayon. Are you serious? The interior is plain, the hood is weird. The top of the line has only 2 airbags and no leather seats. The Ranger's 2.2L 4x2 MT and AT has so much more. I have test driven the Navarra. I can say the ride and power is good but that is all. It should only be compared to the mid spec Wildtrak. And the reason the Navarra is so well priced is because it is almost as bare as the new Hilux but the Hilux at least has safety first in mind with the 7 airbags as well. One of the reasons is they hardly increased their prices in 3 years and they added standard features to the facelifted models. Wala man lang 4x4 na XLT variant. Kulang sa Features: HID Headlamps, Push Button Start, Smart Key Fob. All the other features like the Push Button start is well compensated with all the other goodie. It is disappointing though that something so simple was not included. The HID can be fixed with aftermarket stuff. Sir Uly, it did'nt mention any "rear locking differential"? The Hilux 4x4 G has it. Nissan NP300 dropped that feature in their VL and thats the reason for the price drop. They advertised it before and still they didn't offer it until now? Ranger doesn't have a rear locking differential. Only traction control and stability control which helps during off roading. The ranger comes in different colors ; red, blue, green, yellow, pink. Other version include black and white. This limited edition is called the power rangers. A nice article; thank you. One question: "The range-topping Wildtrak 3.2 adds Lane Keeping Assist and Lane Keeping Aid, Adaptive Cruise Control, and Forward Alert." 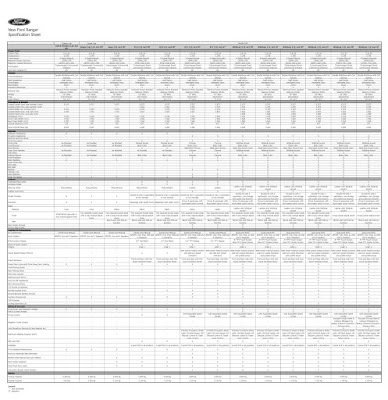 I can't find those specifications on Ford Philippines's website....does that mean the Wildtrak described on the website is still the 2015 model? The features you mentioned are standard on the 3.2 Wildtrak 4x4. Hi Uly, does the 3.2 A/T Wildtrak has curtain & side airbags? Thanks! i like this car.. The ranger comes in different colors ; red, blue, green, yellow, pink. Other version include black and white. Planning to buy a pick up. Hilux revo 2.8AT 4x4 or ranger 3.2AT 4x4. Hilux has a good stance, good ground clearance, affordble parts and availability, good aftersale service,comfort ride,less engine power, untested engine durability, while the ranger has more safety features, good engine power,but hard to find parts, heard issues in turbo, electricals and transmission. Not a fan of hiluxs "unbreakable" claim coz i know its a paid assesment. I like the stance od hilux compare to ranger but i like the power of the ranger. Im confused. Need some advise, please. Planning to buy one before end of 3rd quarter this year. I think you've pretty much nailed the pros and cons of each pickup very well. However, I'm quite concerned with power here in terms of what's written in the specs. Though the Ranger does have a higher output engine, it's not that much faster than say the Colorado or even the Strada which have better or same 0-100 km/h figures. What you should consider instead would be your use for your pickup. The Hilux even in its highest configuration is actually more of a workhorse truck. It has some nifty features and it's well-made, but it doesn't have as much bells and whistles as the Ranger. But it's bound to last longer in the long run and the looks, admittedly, are getting better with age. Personally, if I plan to keep my pickup around 3 years, I'd go Ranger. If long term, I might go for the Hilux. P.S. If there's a Mazda dealership around your area, consider the BT-50 as well. It's powered by the same 3.2-liter inline-5 but the price point is cheaper. In terms of specs, it's still quite competitive. Thank you for the insights sir Ulesses. Gud day mga sir,im planning to purchase ranger wildtrak model,for business purposes,kya pki advise nman mga sir,thanks..
Nkkita ko kc sa image parang right hand drive cya.. I am planning to buy a pickup and honestly, I prefer 3.2L Wildtrak but I heard a lot of concerns about it...specially those turbo, A/C, etc. problems even for a 6-month-old unit. 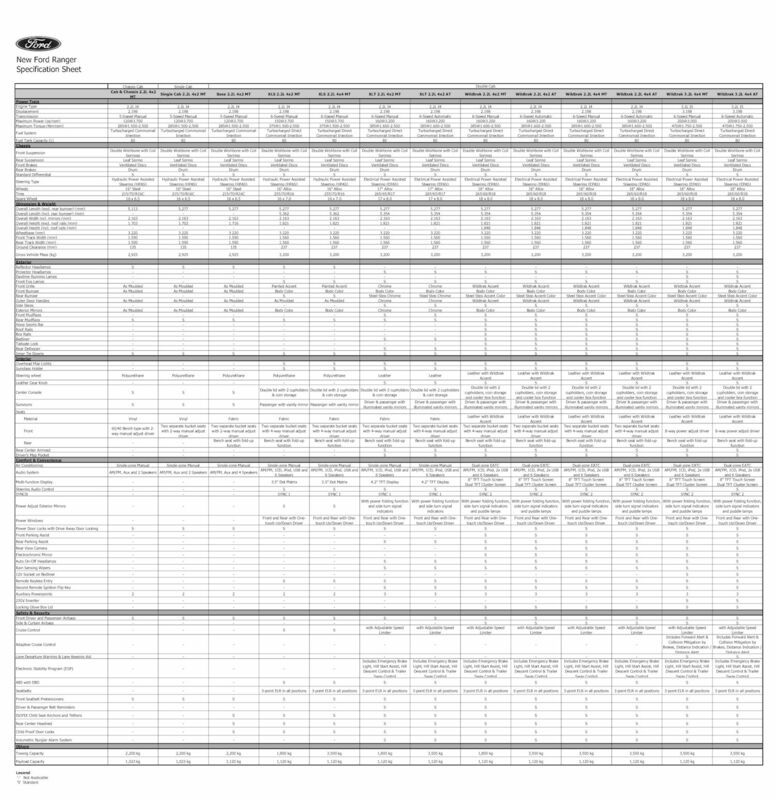 I hope some one can enlighten me, I can't ask Ford personnel to avoid bias inputs.